Don't miss Michael's sermon from this past Sunday, January 7 . 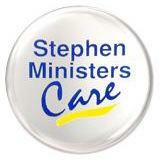 We are currently updating our database and request your assistance in obtaining your current family information. * One form per family. Click here to get started. Thank you in advance for your participation! The Canterbury Choir provides children of the parish an opportunity to participate in a vital liturgical ministry: namely the offering of choral music during times of worship. All parish and EDS children in grades 1-8 are eligible to participate in Canterbury Choir. The Canterbury Choir sings in church during the 10:30 AM service once a month. Aspiring Canterbury Choir members should have a willingness to learn how to sing properly; a desire to make new friends in a large group; an ability to show reverence while providing an important role in worship; and a positive attitude. Training is provided on a weekly basis during the school year from 3:00 to 4:15 PM every Thursday afternoon. We begin with a snack at 3:00, so those who must arrive late are still encouraged to participate. Prior demonstration of singing skills is not required to learn how to be an effective singer. Interested? Please contact Treece Efird at the church, 432-5115, or via e-mail at CanterburyChoir@christ-church.net . Our first blog of 2018 titled, The Joy of Difference , can bring us all inspiration and perhaps get our minds set on a new way of thinking in the new year. 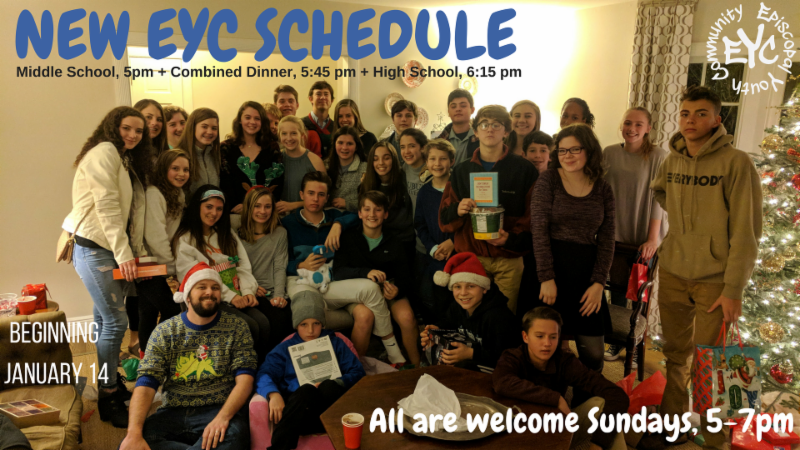 Sandy Early shares her experience when she spent an evening recently with Christ Church youth (EYC) and the Temple Beth El youth. Thank you, Sandy, for the enlightening post! 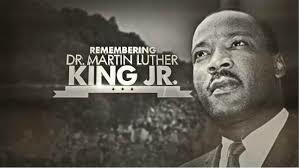 in observance of Martin Luther King, Jr. Day. The Moms’ Book & Bible Study has resumed meetings on Tuesday mornings at 8:00 AM in the Parlor. 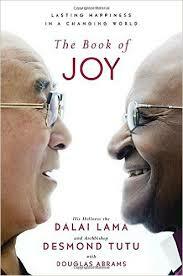 We will be reading and discussing “The Book of Joy” through the spring. All are invited to join the ladies of St. Luke's ECW Chapter on Tuesday, January 16 for a gentle yoga class led by our own Becca Schmidt. Becca is a certified yoga instructor and will lead a class for all ages with a practice of chair yoga. Even if you have orthopedic difficulties, you can participate. We will gather at 11:00 AM for healthy snacks and a brief update of meetings planned for the remainder of the year; the yoga class will begin at noon. Wear comfortable clothes and shoes. Please join us! If you have questions, call or text Bonnie Benz at 850-572-4086. 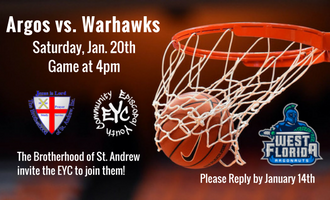 Brotherhood of St. Andrew: Please RSVP to Ray Jones at crayjones@cox.net or 850-449-1315. Brothers will meet at Christ Church parking lot at 3:00 PM and caravan. If Brothers prefer to meet at UWF, please meet everyone at the Field House. Cost: $5.00 (payable in advance). Tickets included. After the game, dinner will be provided (at no charge) including a meet & greet with UWF coaches and players! For more information, please contact Ray Jones at 850-449-1315.
will begin discernment and study for the Order on Saturday, January 27 at 9:30 AM in the Parlor. Any interested women are invited to attend. For more information, please contact Monica Barnard 850-587-6026. Join us for our annual parish meeting between the two services at 9:30 AM (breakfast will be served as usual at 9 AM). There will be reports on 2017 and Father Michael will be casting a vision for 2018. Vestry elections will take place as well with polls opening before the early service and closing after the principal service. **Please note there will be no Adult Christian Education classes that day, but there will be a children's craft workshop and full nursery available during the meeting. Come spend an enjoyable afternoon with brunch/lunch at O'Brien's Bistro, 4350 Bayou Blvd. 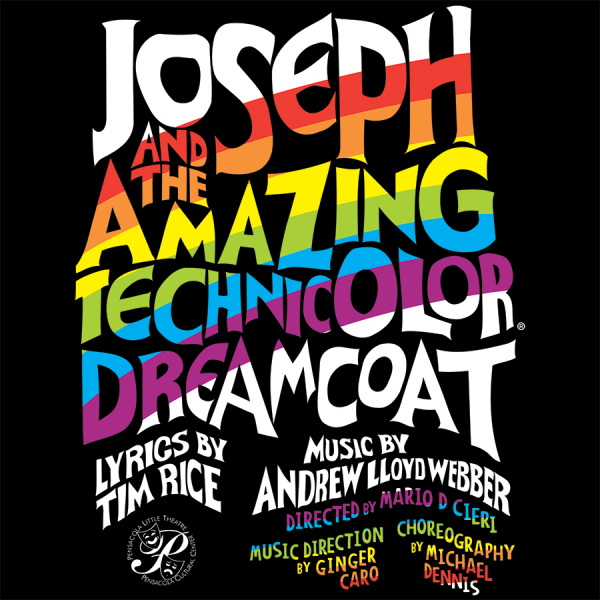 in Cordova Square, at 12:30 PM and theatre performance of the film classic, “Joseph and the Amazing Technicolor Dreamcoat” at Pensacola Little Theatre at 3 PM. One of the most enduring shows of all time, this is the irresistible family musical about the trials and triumphs of Joseph, Israel's favorite son. Colorful and comic and toe-tapping brilliance. The cost is $44 per person and includes lunch and play. We will order from a limited menu at O'Brien's which will include both lunch and brunch items. Please fill out the form (available at Coffee Hour on Sundays) and send with a check payable to Christ Church to Lucy Rentz, 4795 Velasquez 32504. For additional information, please contact Lucy at lucyrentz@cox.net or 432-6366. DEADLINE: JANUARY 21. The EPIC Challenge Book Club voted to change our meeting time to 3:00 PM on the first Wednesday of every month. We will start with the February 7th meeting, at which we will be discussing the Samuel Pepys diaries, led by James Buttram. All are welcome to attend, discuss and illuminate one another. Please see our 2018 book list below! You do not have to be a member to attend, although you may want to join the e-mail list. You do not have to read the book to attend, although you will find your contributions more relevant and meaningful if you do. We encourage lively discussion and respectful disagreement. Welcome! February 7 -Pepys, Samuel: Diary of Samuel Pepys: A selection James Penguin edition; March 7 - Ng, Celeste: Little Fires Everywhere; April 4 - McCullough, David: The Wright Brothers; May 2 - Towles, Amor: A Gentleman in Moscow; June 6 - Ware, Ruth: The Woman in Cabin 10; July 11 - Isaacson, Walter: Leonardo da Vinci; August 1 - Brooks, Geraldine: March / (opt Little Women, Alcott*); September 5 - Backman, Fredrck: A Man Called Ove; October 3 - Montgomery, Sy: The Soul of an Octopus; November 7 - Hanks, Tom: Uncommon Type; December 5 - Erdrich, Louise: The Round House. *The August Book is March, Geraldine Brooks' take on the story of the absent father in the classic Little Women. Emily suggests we read/skim/re-acquaint ourselves with Little Women for a bigger picture of what is taking place. 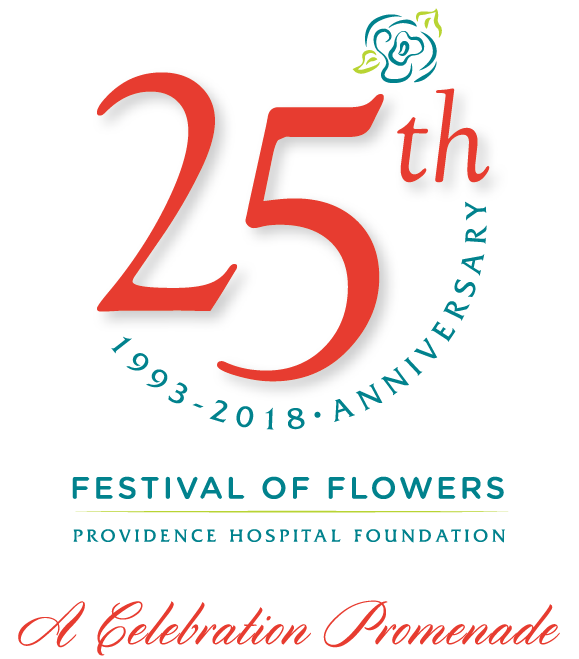 Come join us for a day in Mobile for the 25 th anniversary of the “Festival of Flowers”! Entitled “Celebration Promenade,” it will feature eight life-size landscaped gardens and is the largest outdoor flower show in the southeast. Features include innovative tabletop designs, extraordinary flowers from around the world, and carousel horses extravagantly decked out in floral splendor, delicious cuisine at the Garden Cafe and unique gifts at the shops in the Garden Market. Lunch will be available at the Garden Cafe featuring several different sandwiches and non-alcoholic drinks for $9 or you can bring your lunch. You can either eat at the Cafe or bring it on the bus. There will be ample time to eat on our way to Bellingrath Gardens where we will enjoy an afternoon of touring the beautiful Home and Gardens. Built in 1935 the 10,500 square foot home has 15 rooms that are furnished with original antiques. The gardens include 65 acres of year-round beauty. We will depart PROMPTLY at 8:30 AM and return by 5 PM. The bus will be on Belmont Street adjacent to the church parking lot. The cost is $62 per person and includes transportation, admission fees, bottled water and tip for the bus driver. Please make checks payable to Christ Church and send to Lucy Rentz, 4795 Velasquez, 32504. For more information, please call Lucy at 432-6366 or lucyrentz@cox.net . YOUR CHECK IS YOUR RESERVATION. Please fill out the reservation form (available at Coffee Hour) and return it with your check . Friends are welcome! We know that there are many demands on your time, so we are changing our EYC schedule to make it easier for you! Everyone can arrive at 5 PM and stay until 7 PM! When your group isn't meeting, you will have time to hang out in the Undercroft, use the game tables, or have access to the quiet study room. You can even bring a group of friends and study for that big test! Snacks and drinks will be available during the rec and study time. During the weeks we have off-campus events, the schedule will vary. Are you an 8th - 12th grader interested in Youth Confirmation? Classes will be held during Sunday School from 9:30-10:15 AM, beginning on January 21st and concluding with Confirmation Sunday on May 6th at the 10:30 AM service. The required Confirmation Retreat will be April 20-21 at Camp Beckwith . Schedule with FAQs is available here. 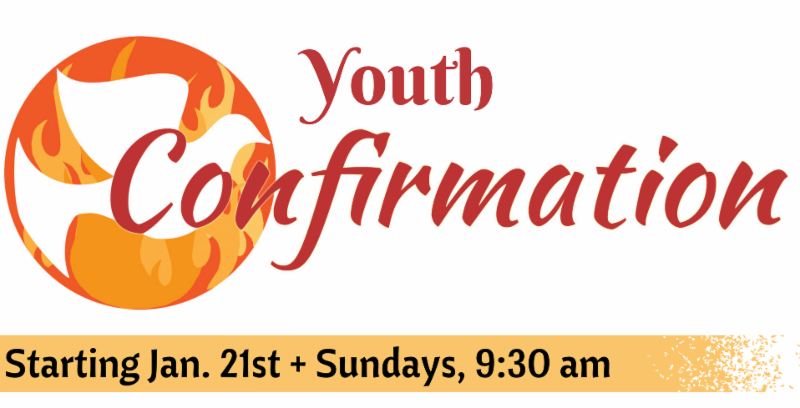 Register for Youth Confirmation, here. 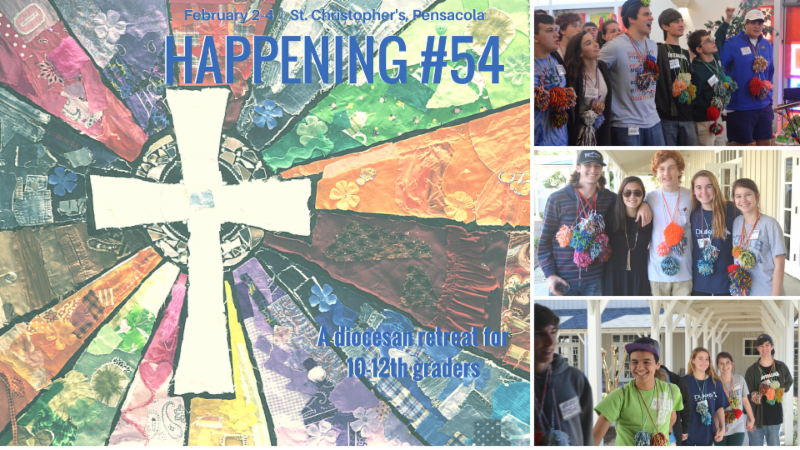 Happening is a spiritual formation weekend for 10-12th graders presented by teens and for teens on February 2-4 at St. Christopher's, Pensacola. There are talks, small groups, games, music, and unique worship experiences. Spiritual Directors for the weekend include Bishop Russell and Mary Alice Mathison. Click here to register online . Registration closes on January 19th. More details at diocgc.org/happening . Rector's Class — Fr. Walt leads the Rector's Class for a five-part video discussion series from Max Lucado, titled " Anxious for Nothing: Finding Calm in a Chaotic World ." Karen Armstrong writes “…this program is designed to bring forth the compassion that, as we have seen, exists potentially within every human being so that it can become a healing force in our own lives and in the world.” St. Luke writes in 6:36 Jesus telling his disciples, “Be compassionate, as your Father (God) is compassionate.” Our group is studying, contemplating and practicing ways to be compassionate Christians in a time which often seems hateful, callous and dangerous for the compassionate. As a resource for our work we are reading Karen Armstrong’s book, Twelve Steps to a Compassionate Life. As preparation for the discussion you might want to read “The First Step” on pages 25-64. You may also want to share a quote, poem, writing, prayer, scripture text, or other material which inspires you to live compassionately. Books are available for $12. Please contact the facilitator, David Starling, by phone/text (850) 712-0977, or email dastarling@cox.net if you have questions. This class meets upstairs in the Library of the Christian Education Building. Led by Meredith Jones. who visited with us on 7 January, 2018.
who have transferred to us from St. Luke's, Atlanta, GA.
and to the family of Laura Thornton Boellaard Harrison who died on 31 December, 2017.